When it comes to bag's, frankly, I'm addicted (I'm also addicted to shoes, clothes beauty products... But we all know that!) and I have soooo many! But after trying to have a wee sort out I realised I didn't have a single beautiful black bag - What?!?! I know. Well one that warn't studded or clutch i.e. a more everyday bag. So I went in search of one... Low and behold, of course I found myself looking at the famous Zara totes, now I've got a zara plaited tote, but it's in brown and as much as I love it, it's seen much better days - so it was time to update! Of course looked at their famoud black tote that everyone loves - I mean so do I! But everyone has that bag and I wanted something different. So I looked at the 'Cut Work' bag, but after reasoning I wasn't willing to part with £130 for a bag with holes in, that could get my work or anything wet, I wanted something I could use all the time not just in the fair weather, that comes on days far and few in between in Britain .. Then I found my baby, and it actually wasn't online - I was in Birmingham, somehow managed to find myself strolling in the Zara store and this two toned beauty stood out immensely for me... I was drawn to it. My chap actually said get it but I was trying to be sensible (Though my card was burning a hole in my vintage clutch!) and decided to leave it... But typical me could only wait until the next day to put the order through! I love how it fits perfectly in to my beloved monochrome trend, but also works well for work, uni and just generally shopping ect... It also goes with pretty much everything - and I definitely don't have any buyers remorse for this baby! One more thing just because it made me smile- it came in the biggest box and inside there was a lovely little fact about the spring/summer equinox - which if you're a huge nerd like me and actually love that sort of fact! So tell me what you think of my new baby! Have you got a Zara bag? I am definitely addicted too. It's so hard to say no! I love that bag though - definitely a great buy. 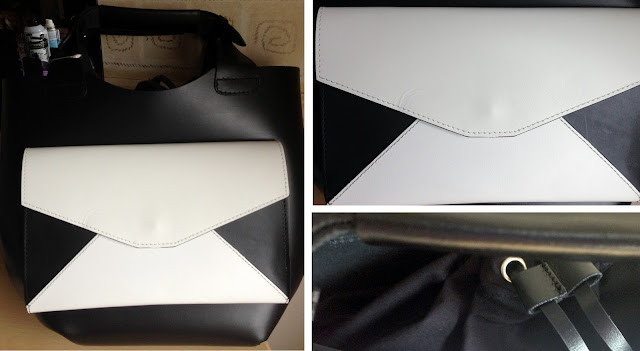 I love how it slides into the monochrome trend as well, it's an amazing clutch! Zara is lile my fav!